14. Choice Of Law and Forum. This Agreement shall be governed by, and will be construed under, Canadian law; provided, however, if you are a resident of the United States, this Agreement shall be governed by, and will be construed under, the laws of the State of New York, United States of America, and you irrevocably agree to the exclusive jurisdiction by the federal and state courts located in the County of New York, in the State of New York, to settle any dispute which may arise out of, under, or in connection with this Agreement. YOU AGREE THAT NO CLAIM ARISING OUT OF THIS AGREEMENT OR YOUR USE OF THE WEBSITE MAY BE BROUGHT AS A CLASS ACTION. 15. Data Processing. Dentons takes the view that it is the “Data Controller” when it processes personal data related to and/or received from our clients and ultimately takes responsibility for managing that data in compliance with applicable data privacy regulations. 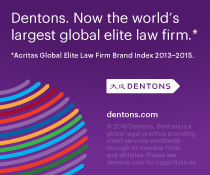 Consequently the obligation to enter into a “personal data processing agreement” does not apply to Dentons and such agreements shall not be signed by us.